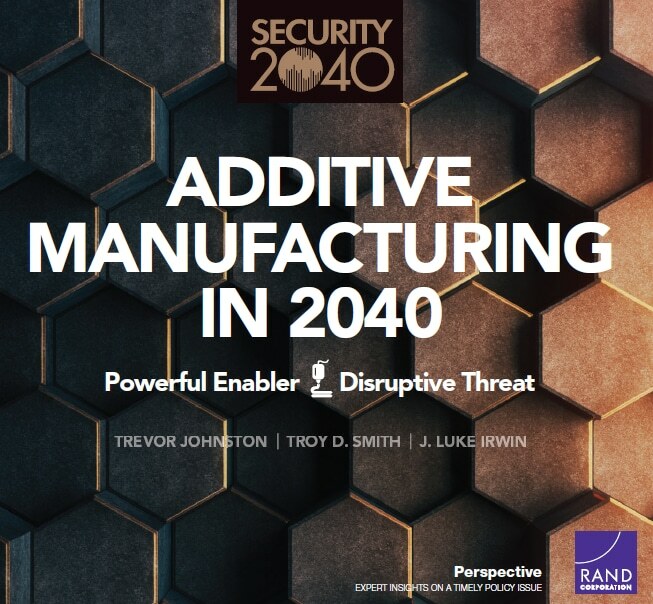 TEAMM Principal Investigator, Mel Cossette, was recently interviewed for a special report by RAND Corporation: Additive Manufacturing in 2040. The report subtitle: Powerful Enabler, Disruptive Threat looks at how companies, and by extension, educators, might want to prepare for various challenges and big opportunities facing the growing AM opportunities. RAND Corporation, a nonprofit institution that helps improve policy and decision-making through research and analysis, produced the report as part of a broader effort of its RAND Ventures to look at security challenges our world may face in the next 20-plus years. The research was conducted within the RAND Center for Global Risk and Security. As additive manufacturing (AM) technician education increases, it is helpful to look at the effects of political, technological, social, and demographic trends facing 3D printing. This short, free report may give future graduates ideas for new AM products and services. RAND’s report aims to do just that and increase awareness of how our uses of AM might profoundly impact global and local economies. As the RAND report makes suggestions for how companies and governments will want to prepare for a secure future, students and technicians can use this report to consider career directions and business opportunities they might want to pursue. Download the Additive Manufacturing in 2040 report.